A developer is just weeks away from submitting plans to Bath and North East Somerset Council for a 306-berth marina on the River Avon in Keynsham. 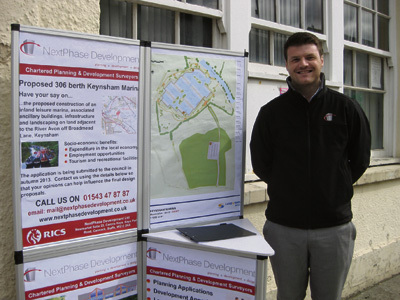 Christopher Whitehouse, the managing director of Next Phase Development, presented the scheme to Keynsham Town Council on October 1 - the same night the River Regeneration Trust set out its vision for a riverside development on nearby land, including a marina (click here to read more). The site has Avon Valley Adventure and Country Park to the east and Pixash Lane, which would provide access, to the south, and Mr Whitehouse revealed that his proposal would also include car parking, a marina office, chandlery, a cafe and landscaping. It would, he said, act a as a tourist "hub" for the town with signs on-site directing visitors to shops and facilities in Keynsham itself, with cycle hire available at the marina and paths leading into the town. He said: "We will work with the council to make sure that the (tourist) information is there, and is clearly accessible, to allow people to move into the town and not just stay at the marina." When asked how the marina plan fitted in with the previous presentation by The River Regeneration Trust, Mr Whitehouse said his company's scheme was about two years ahead of the trust's plan but he hoped the concept would be successful. Flooding in the area was also taken into account in the plans, he said. Anyone who would like to find out more about the proposals can email Next Pase Development at mail@nextphasedevelopment.co.uk.